Metastasis from distal solid organs to the esophagus is very rare. Renal cell cancer with esophageal metastasis is extremely rare. We present the first case report of undiagnosed renal cell cancer presenting as dysphagia. A 56-year-old Caucasian man presented for dysphagia evaluation. 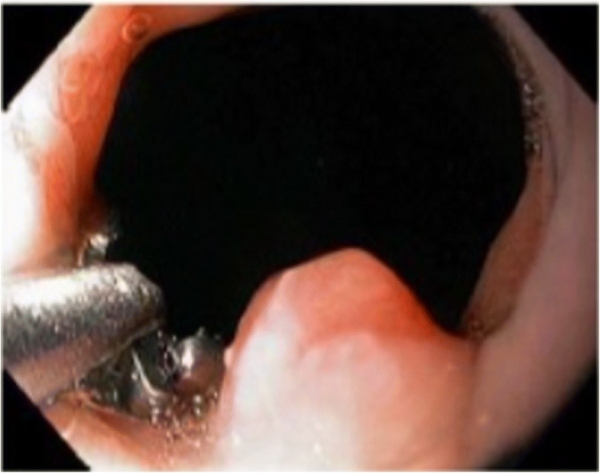 An esophagogastroduodenoscopy examination revealed a 6 mm nodule located at gastroesophageal junction. Pathology and immunohistopathology were suggestive of metastatic renal cell cancer. Abdominal imaging revealed a large renal mass consistent with renal cell cancer. He underwent left nephrectomy and is clinically asymptomatic, while being monitored by Oncology and Urology.